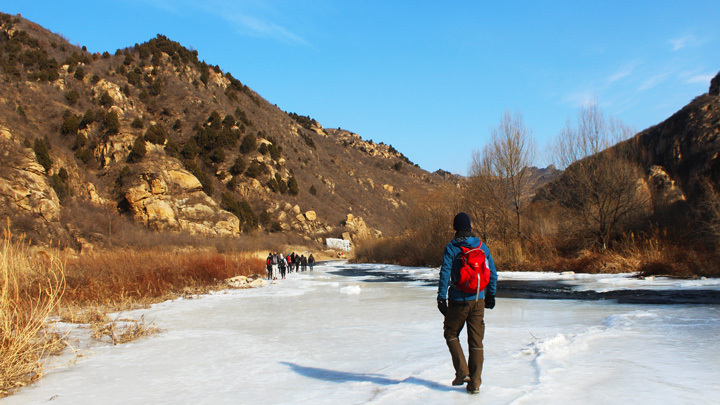 In Brief: Follow a trail that crosses a frozen river in Miyun District, walking out down a long canyon and passing below cliffs on the way to the end. Hiking down the frozen White River. 3–4 hours of hiking over approx. 12km. Note: At this time of the year the river should be frozen thick, no problem to walk on. We’ll call our local contacts for an update in the week before the hike. If we get to a place where we can’t safely cross, we’ll stay safe and turn back. After an interesting drive through the mountains of Miyun, we’ll arrive at a small scenic area where we’ll begin the walk. The scenic area has a long track down a narrow gully that will bring us to the riverside. We’ll be following the White River as it winds through a deep and wide canyon with numerous forks and steep rocky cliffs, making this an extremely picturesque hike that is easy to finish. All up, there are around eight places the path crosses the river. In summer we need to take our shoes off to wade across, but in winter we’ll be able to walk across the thick ice. At times, the trail leads us through trees, but for most of the walk we’ll follow the course of the river. It’s flat the whole way, and the only thing that might slow us down is slippery ice. Sometimes, we cross over ice that has frozen clear, and we can see all the way down to the bottom of the river. It’s like walking on thick glass – a little unnerving, but very pretty! Midway on the hike we’ll stop for a quick lunch in a nice spot with rocks and (hopefully!) a bit of sun. From that spot we’ll walk on down the river, crossing a few more times on the way to the end. After we’re done hiking we’ll unpack our picnic tables for snacks and drinks, and then we’ll head back to Beijing. Chains or cleats for your boots, if you have them. You’ll need good balance to cross the ice. It was a cloudy and chilly day for this hike down the White River—see 23 photos. 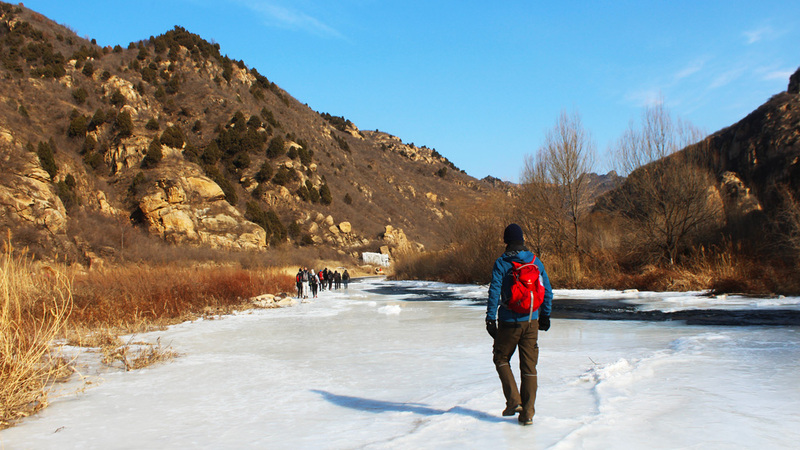 18 photos from a hike down the frozen White River. Ten photos from the White River Ice hike. 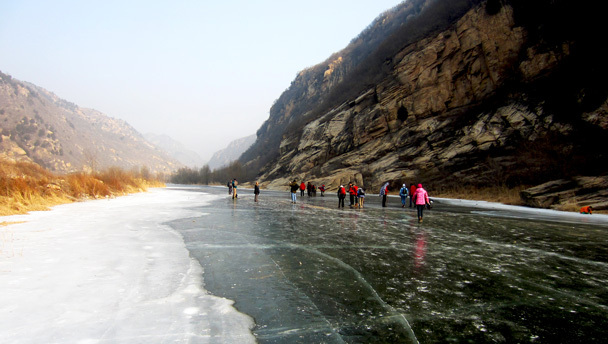 Fourteen photos from a specially-arranged hike down the frozen White River. Photos from our hike along the frozen White River.